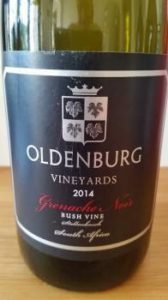 There’s not a lot of Grenache Noir planted in South Africa – 305ha at the end of 2014 – but it’s dead fashionable and anybody who’s got it is going to be tempted to try his hand at a single-variety version. Witness Oldenburg in Stellenbosch who have released a 2014 from bush vines planted in 2011. Inoculated with a Syrah yeast, it was matured for 20 months in French oak barrels, 50% new. On the nose, it shows red cherry and cranberry, cinnamon and vanilla. The palate shows plenty of fruit, moderate acidity and soft tannins. It’s appealing enough but lacks a bit of density and detail while the influence of oak is quite noticeable. Pricy at R250 a bottle.